Posted on Tue, Apr 10, 2012 : 6:59 a.m.
Ann Arbor.com published an op-ed piece a few weeks ago that was written by a gentleman expressing his frustration about this year's terms for buying University of Michigan basketball season tickets (New U-M basketball ticket fees are an assault on the most loyal and long-time fans). The big difference between his situation and ours is this: he purchased tickets for 30-some years; we purchased tickets for more than 50. That's right, we go back to watching basketball in Yost. The year Crisler Arena (now Crisler Center) opened, we sat in the sixth row at mid court. Dot and Russ Reister of Chelsea are long-time University of Michigan sports fans who say they are being priced out of Crisler Center by the new seating fees. We've been moved around a bit but we have always been in the sixth row and a good spot on the court. However, this year we have been classified as not good enough fans to qualify for the privilege of purchasing the seats we have enjoyed all these years. It is true we have not contributed thousands to the Athletic Department. Our meager discretionary funds have been spread around. The Athletic Department generously offered to let us buy other seats, seriously removed from what we have had. IF we had qualified for our seats, the "fee" would be $500 this year and $1,000 next year, that would give us the privilege of buying those two tickets. The actual tickets would be an additional approximately $900. U of M basketball and football have become entertainment of the wealthy! We still enjoy cheering on the Maize and Blue so we are simply shifting gears and recommend this as a solution for the many others who have been disqualified from their basketball spots. We're going to cheer on the LaCrosse team. For five or ten dollars we go in, sit where we choose among the enthusiastic loyal fans. They are a varsity level sport and truly appreciate our support. If LaCrosse isn't right for you, how about softball or swimming or track. They are all good Michigan sports and affordable family fun. With the money you will have left over give to your favorite charity, your alma mater or North Star Reach, the camp for children with serious health challenges that the U-M Health System is developing on Patterson Lake. There is life beyond basketball!!! 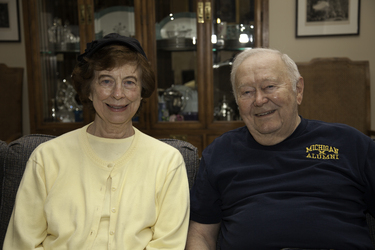 Russ and Dot Reister live in Chelsea and are longtime Michigan sports fans. Tue, Nov 27, 2012 : 4:02 a.m.
Brandon likes to say he's a numbers guy... I wonder how many New season ticket buyers there have been in the last 2 years when the priority point plan started and forced folks like the Reisters to decide that they couldn't afford their basketball seats? I'm sure those non-renewing numbers are there.. but as long as there are others who are ready to pay for the seats.. the cancelled seasoned order number gets buried. I'll bet that when the Athletic Dept gets around to asking some of those folks for bequests..they'll get some &quot;interesting&quot; responses. Tue, Nov 27, 2012 : 3:55 a.m. I'm waiting for the Feds and IRS in their search for more dollars to redistribute.. to seriously ask the UM to justify why 80% of the seat taxes for Football and Basketball should be consdered tax deductible. With around 800 varisty athletes at the UM, the extra dollars squeezed from season ticket holders sure far exceeds the scholarship dollars used to support those students !! Why should a gift to atletics be 80% deductible when a gift to LSA or the Band is 100% ???? Mon, Nov 26, 2012 : 7:16 p.m. I commend the Reisters for submitting this article. My father, a retired U of M professor and alumus who has supported athletics for over 40 years, has been moved around Crisler several times, most recently to corner seats, higher up, with much less visibility to the basket. Most years our seats were center court, within the first several rows. It is wrong to push out senior citizen alumni, who've supported M sports for decades, in pursuit of larger &quot;revenue streams&quot; by placing them in less desirable seats, simply because they can't afford the extra mountains of cash now required. Considering the age of these alumni, I find it ludicrous that the Athletic Dept. could not let these retirees keep their seats for however many years remain for them-- the percentage of season ticket holders in this demographic cannot be so great that this was not possible. It's a shameful and degrading way to treat them, Mr. Brandon. Instead of asking more from them, you should have allowed them to stay in their seats and given them a senior discount. Bad policy and it reflects poorly on the whole university. Mon, Apr 16, 2012 : 5:04 a.m. These sports do not exist solely to entertain the spectators. Why then should the spectator foot the bill for everything from scholarships to the arena light bill? The presence of cheering fans should be the goal. Not maximizing ticket revenue, through seat license fees or otherwise. Not when it means treating longtime, steadfast fans like dirt. Sun, Apr 15, 2012 : 8:58 p.m. I will chime in as one who is disappointed in the new ticket policies as so well articulated in both this and the previous article. I understand the need for funding and the trends in college athletics, but my years of loyal and expensive purchases don't even add up to being able to claim my current seats- up above the bowl! I found last season that I couldn't unload my tickets I couldn't use for face price, or barely even give them away, so the games I actually attended cost me dearly as it was. I may take my chances on renewing in the areas that don't require a seat fee, we will see. I may get some tickets on Stub Hub, but then the Athletic Dept. won't get any of that transaction (or do they get a cut from the 25% Stub Hub gets?) Will the U actually sell out the seat fee areas due to a mass exodus of fans like us? Again, we will see. Thu, Apr 12, 2012 : 4:30 p.m.
$70 bucks for M vs. Eastern Michigan University last fall! And how about all the kids that want to go to a game? How can a family afford to do it? I used to take my wife and three kids to M hockey games for about $18 total! Big business!!! Sorry for these folks that are being ignored for their lifetime of loyalty. Yes the U has lost it's moral compass. Thu, Apr 12, 2012 : 1:16 a.m.
After 17 years of season football tickets, I've reached the end point. I won't renew this year unless someone decides they wan't to buy all my tickets. I love the maize &amp; blue, will continue to passionately follow them, but I'm done with season tickets. Wed, Apr 11, 2012 : 2:15 p.m. Similar to students, U of M sports fans are not wanted. The university wants paying customers, not students or alumni or fans. If you want that fan rush, join the loyal Hurons at EMU . . . oh, I forgot. Wed, Apr 11, 2012 : 11:29 a.m. If you enjoy basketball, and want affordable basketball, you need to look no further than 7 miles down the road at EMU. Wed, Apr 11, 2012 : 10:40 a.m.
Disgusting, and arrogant on the part of the UM. $500 or $1000 to have the privilege of purchasing tickets. Again, disgusting, especially when long-time UM supporters (fans) are kicked out for the privileged few. Wed, Apr 11, 2012 : 1:25 a.m.
Well written, Mr. Reister. I applaude your voice and your advice. Wed, Apr 11, 2012 : 12:57 a.m. The Reister's look like nice people. Somewhere, the University has lost its moral compass. Tue, Apr 10, 2012 : 11:18 p.m.
Makes me wonder how much longer until the sports ticket price bubble will burst? $2000 a year for tickets just dosn't seem worth it. Tue, Apr 10, 2012 : 11:08 p.m.
As an EMU alum I bought 2 season tickets to EMU men's basketball for 93 dollars. Parking is free and the games are very entertaining. I saw two tournament teams come into the Convocation Center - MSU and Ohio University. They have a 7 foot center and 2 new transfers from D1 programs that will start next year. Cheer loud enough and you will get free T-shirts and pizza! Come give it a try! Tue, Apr 10, 2012 : 8:46 p.m.
Wolverines are just a Business.... operating with free indentured servants/students workers. And before you mention scholarships, tell me they can pay there way and sell there own jersies, likeness, etc.....right, it's a scam to get free under paid labor. Now they want to screw over the fans that paid through all the horrible years. I'd say goto High School games. We all know public schools need the money that is being given to the Oil companies, Corn growers, and other corrupt industries. Tue, Apr 10, 2012 : 8:20 p.m.
What about rotating seats at these popular venues, allowing all the fans to get the courtside experience during the season, and all the fans to get the nosebleed experience. Tue, Apr 10, 2012 : 6:41 p.m. Truly the embodiment of the phrase &quot;when life gives your lemons, make lemonade&quot;. Amazing couple. Out of respect for their wonderful attitude, I won't say what I think about the U on this one. Tue, Apr 10, 2012 : 5:20 p.m.
My dad is in the same boat. He's had season tickets since back to the Rudy Tomjanovich era--more than 40 years. Not only that, but he played for the Wolverines from 1949 to 1952. Under the new &quot;rules,&quot; none of his season ticket loyalty before 1992 counts. And his membership on the team doesn't count any more than if he was on the track team. I'm going to help him pay the freight for his tickets...but the sad thing is that we likely won't get our fifth row seats. Pretty harsh treatment, I think, for someone who went to the games through thick and thin for 40 years--and played on the team. In fact, at the recent alumni event, he was the second oldest player. Tue, Apr 10, 2012 : 4:11 p.m. Check out the EMU team. Low cost, good seats, and next year a local high school talent will be on the floor, something Michigan has had a hard time accomplishing since the Fisher era. Tue, Apr 10, 2012 : 3:53 p.m.
Tue, Apr 10, 2012 : 3:41 p.m. So many of my parents friends will be letting their tickets go. My family has been getting tickets for 30 yrs. They will try one year to see where they get placed outside the &quot;premium&quot; seating they are losing. My thought is, Crisler Arena is rarely packed. If all these loyal fans who stayed when the teams was really bad are going to quit, who is going to buy tickets? Shame on you UofM for abandoning your faithful fans who cheered you on when you, quite frankly, sucked. They stuck it out with you, cheered you, and now that you have had the best season in over a decade you abandon them. Greedy, selfish and stupid move. Tue, Apr 10, 2012 : 3:28 p.m. I admire Russ and Dot's attitude. I do, however, wonder why a certain percentage of &quot;revenue sports&quot; tickets - say 5% - might not be reserved for patrons who can demonstrate both loyalty and need. I'm thinking of the model now much en vogue of low cost housing that is a part of most new building projects where a certain percentage of affordable units are offered alongside the luxury ones. Certainly the University maintains records that could track loyalty, and would it be too difficult to ask for an income tax record among the most loyal to verify whether they might qualify for reduced-cost seating? It seems a rubric that would be as easy to develop as the one currently in place to determine seat licensing fees. My wife and I have held season football tickets since we attended UM for our undergraduate degrees in the 1980's. We both teach high school students for a living, so we are hardly &quot;fat cats.&quot; I would, however, happily pay a modest ticket &quot;tax&quot; on my season tickets if that &quot;tax&quot; went to provide reduced-cost seating to people like the Reisters. I noticed that Don's shirt suggests he is an alumnus of Michigan. Surely we can do better for our alumni. Tue, Apr 10, 2012 : 2:52 p.m.
Men's Football, Basketball, and Hockey are the only sports that generate revenue (and Hockey is pretty much break-even). These sports pay for themselves and the remaining 24 non-revenue generating varsity sports. It's interesting that LaCrosse is mentioned because it is a new varsity sport for the men this year and the women's varsity team starts next year. Where do you think the money comes from for the additional scholarships, travel, facilities, equipment, and coaches? Thank the person sitting in your old seat at Crisler. Further, the cost of scholarships has gone up at the university, travel is more expensive, and all of the facilities need upgrades and maintenance. A minor increase in cost in any one of these areas will have a substantial effect on the three teams that bear the burden of 27 varsity sports. Tue, Apr 10, 2012 : 2:23 p.m.
You want to be treated the same as somebody with a pile of money to throw at the program? Sounds like socialism to me! Respect has no place in pure capitalism. Only greed. Wed, Apr 11, 2012 : 10:39 a.m. Disagree. The long-time fans want to be treated respectfully. There is no socialism here. Tue, Apr 10, 2012 : 1:42 p.m. It's their world, David Brandon's world, and we are just lucky he allows us in! Tue, Apr 10, 2012 : 1:41 p.m.
After 50 years of being loyal fans, U of M should provide the Reister's with the best possible tickets at no charge. Tue, Apr 10, 2012 : 1:26 p.m. The 'mandatory donation' now used in college sports is a scam -- it's tax evasion, pure and simple. That money is NOT a real donation, it is clearly part of the ticket price. But schools pretend it's a gift so ticket buyers can deduct part of the cost on their taxes as a charitable donation (and so schools can charge even more for tickets than they could otherwise). Wed, Apr 11, 2012 : 11:37 a.m. It's not tax evasion. The IRS allows deducting 80% of your donation to a school's sports programs because they know you will get something in return (i.e. free tickets, or just the price of admission to buy tickets, depending on the school). Tue, Apr 10, 2012 : 1:25 p.m.
Have they even fixed the bathrooms at Crisler yet? Tue, Apr 10, 2012 : 1:03 p.m. I realize that athletic departments have to raise revenue on football and basketball (and hockey)to fund the rest of the sports in the department. However, there should be a way to reward ticket holders loyalty. I hope that's what the athletic department tried to do when the Reister's said: &quot;The Athletic Department generously offered to let us buy other seats&quot; The premium seat will go to the highest bidder but I hope the seats offered the Reister's were at least court side lower bowl seats. When they said, &quot;seriously removed from what we have had&quot; I hope that didn't mean behind the basket in the upper bowl. Tue, Apr 10, 2012 : 2:58 p.m. If they have not given a lot of money to the Athletic Department, the BEST they will do is near the top of the lower bowl behind the baskets, and they will be lucky to be there. That is how the new system works. While the Athletic Department says they have given significant weight to loyalty, what they have done is of almost no value in the big picture. Folks like the Reisters are just out of luck, because they do not fit the current administration's desired demographic--They aren't RICH enough! Tue, Apr 10, 2012 : 12:38 p.m.
And people wonder why UM football/basketball games are so quiet and laid back? It's because the best seats are filled with RICH PEOPLE!! It is a scientific fact rich people make bad sports fans. Tue, Apr 10, 2012 : 12:36 p.m. I remember the days in the '50's when they could not fill the football stadium. We had Band Day! Oh the memories and playing with all the other high school bands under Doctor Revelli. Now sports are BIG business. Takes wealthy to afford to go to the games! Tue, Apr 10, 2012 : 12:34 p.m.
Don't forget about soccer! It's a big sport around the world, and the UM team has a nice stadium. It's great entertainment for the whole family. All the seats have great views, too. Tue, Apr 10, 2012 : 6:49 p.m.
Maybe, but soccer is so boring. I'll stick with field hockey. Tue, Apr 10, 2012 : 12:04 p.m.
Of Course ! Seats at major schools are allocated according to continuing contributions. Sometimes lifetime contributions are counted as well. Congrats on finally having a big-time basketball program again. Now hope it isn't ruined again. These dollars go to pay for all the non-revenue varsity sports. Want a men's diving team ? Pay. Girls volleyball ? Pay. If you are unable to step-up and pay then I suggest a nice cable basketball package. College sports are entertainment. If you don't want the seats, the AD is betting someone else will. If wrong, then it is his job. Legacy ticket buyers are that - legacy. They enjoy no special premium. There is no reward for for loyalty. You make a choice, you pays what you will, you take what it buys. Pay to play. Complain ? Sure - you have every right. 1st Amendment. Of course, you are owed nothing. Thu, Apr 12, 2012 : 12:26 p.m.
Wolfman &quot;Of course, you are owed nothing.&quot; Since when does someone pay for something and is owed nothing? They bought basket ball tickets for 50 years and many of those years they got nothing except a warm seat! Wed, Apr 11, 2012 : 12:39 p.m.
Ron, I have read many times in this newspaper that the football and basketball programs support the whole althletic department, including 28 varsity teams, inckuding tuition for all of those student athletes. I didn't think there was any question that the sports programs are not supported by tax money. Tue, Apr 10, 2012 : 2:47 p.m.
You comments are true to a point except that the Michigan Athletic Department operates in the black. No arguement from me in paying for all of the non evenue sports. I come from one myself. Loyalty should count, especially after 50 years. My point is that the athletic department can afford to make some considerations. Dave Brandon should know very well that loyalty and repeat customers in business allows a healthy and successful business. The Reisters bleed more Maize and Blue and even I do. Tue, Apr 10, 2012 : 1:23 p.m. I feel certain that your claim that this price is due to the men's diving team, volleyball, etc, is completely wrong. Otherwise, how was it funded in years past, when basketball tickets were less expensive? This is a state funded university, not a for-profit sports institution. Tue, Apr 10, 2012 : 11:59 a.m.
My vote.....cut Mary Sue's salary..... The University is arrogant...and out of control with Michigan taxpayer money. Wed, Apr 11, 2012 : 12:08 p.m.
Cut both of their total payments, but especially Hoke's. Wed, Apr 11, 2012 : 2:28 a.m.
Actually Brandon's salary is higher than Coleman's, so that's the appropriate salary that should be cut. Seeing as how he's in charge of athletics. Tue, Apr 10, 2012 : 3:06 p.m.
Don't you have a more original suggestion? No matter what complaint you (or some of the other commenters here) have about UM, it's always 'concern over taxpayer money', even if theree is none involved, like in the athletic department, and the proposed 'solution' is always cutting administrators pay and / or firing them, no matter how little they have to do with whatever irks you. Tue, Apr 10, 2012 : 12:09 p.m.
Tue, Apr 10, 2012 : 11:21 a.m. I am sorry that the Reisters haven been priced out of a lifetime of joy as sports fans, but they are right: go see a different sport. I say go watch a different school. Give your money to a charity that needs it and participates in the community. Wed, Apr 11, 2012 : 12:09 p.m.
Tue, Apr 10, 2012 : 11:18 a.m.
First of all, many thanks for publishing this article. This is a real slice of life and illustrates the bitter truth about how the University's Athletic Department chooses to market their big revenue sports program's ticketing strategy. It has been said by a few fans that there is more of a country club attitude. Take into account the recent football ticket price increases. The same attitude applies. The sad part is that there is such a long waiting list for season tickets that stories like these get washed out. As much as I bleed Maize and Blue, I am critical on the aggressiveness the Athletic Department has regarding these constant ticket price hikes and fees...and the arguement is: this is a common practice amongst other universities.